Mouse-over for a downsized Mirtha! Hello all you domestic diva wannabees! In this installment of Mirtha we will delve into small space decorating. Since it seems likely that I will be down-sizing my living quarters in the near future, here are what I hope will be some helpful decorating suggestions for dorms, cells and other small…and I do mean SMALL spaces! Neutral shades are key - mouse-over the room to see a simple privacy screen. Color is so important. If my new um... landlord ...allows me, I intend to paint the 3 main walls a lovely neutral shade that won’t clash with my new clothing line, “Mirtha Stuwort Pumpkin Orange Jumpsuits!” Don’t you think orange is such a warm, cozy color? I might have to resort to a simple black and white ensemble but I hope not – I don’t look my best in stripes! Handcuffs make elegant tiebacks - mouse-over the simple ones above to see a more ornate version. Curtains are a must. I won’t have to worry about windows in my new abode – but my fourth wall will definitely need some kind of covering. Being a frugal woman, I am planning on using some of the sheets from my own “Mirtha’s Linens Line” and fashioning my draperies from them. Don't forget elegant drapery tie-back hardware! I will have an en suite powder room area so I will need to screen off that area. After all we decorating divas do need our privacy don’t we? Simple screens can be made from old closet doors, French doors or even artists’ stretcher frames that are covered with a perky print fabric. Although I doubt I will have access to a staple gun around there. Maybe a glue gun…er…no. I better not say gun or I will get in trouble! Sigh…what is a domestic goddess to do? And seeing that I will be living in such close quarters with the other…er…tenants, I think some potpourri is in order. A good strong one I think! 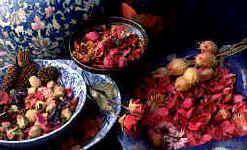 Here’s a great recipe for Rose Potpourri! Spread fresh rose petals in a thin layer on a cookie sheet. Store the sheet in cool, dry place for several days, making sure it’s away from direct sunlight. When the petals are crisp and brittle and crumble easily, pour them in a container that has a tight fitting lid. Add five drops of rose oil and five drops of *glycerin. Close and gently shake for a few seconds. Do this every day for 14 days. On the 15th day, add one tablespoon each of cinnamon, nutmeg, and allspice. Shake one last time and then enjoy!! *You can find glycerin in the cosmetics aisles or ask the pharmacist. My new landlord, Mr. Warden, is allowing me to furnish the cafeteria here with some of my favorite recipes. Here’s a lovely one to feed several hundred at a time. Just times the ingredients by 100 and you’re all set. Hey maybe I can lend a hand in the kitchen! "Meat Loaf of the Week" anyone? 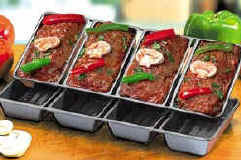 Monster meatloaf - just multiply the recipe to feed hundreds! Mix all loaf ingredients; press into 9 x 5 x 3 inch bread pan. Spread on sauce. Bake 1 hour at 350 degrees. Let stand before serving. Seeing that the shower facilities leave a lot to be desired, I am stockpiling my own special soap. There will be enough to last several years if needed. (I hope not!) In fact, the last case is going on the truck as I write this! Why don’t you try this simple recipe for your own homemade soap? Make your own special soap! Grate soap in a blender or food processor. Add some almond oil into the bowl. Add the soap into the bowl. Take the water from the pot and add it into the bowl until soap changes into paste. Add oils, color, and vitamin E as desired. Let cool in molds of your choice. You can use anything for a mold - ice cube trays, cookie cutters or your own hand. Mirtha covered - mouse-over for the orange jumpsuit! I would love to receive some correspondence from you wonderful fans. Hey we could be “Pen” pals! Oh speaking of pen pals, I am meeting my new roommate soon. Her name is “Bertha”. I wonder if she likes to make the world a lovelier place too? Well who wouldn’t?